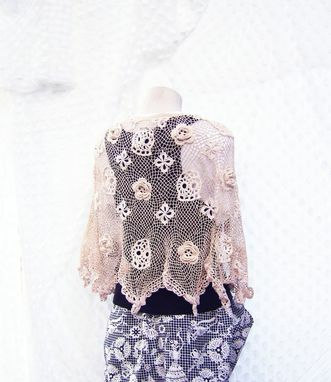 The "Arsenic & Old Lace" capelet has a skulls and roses motif, accented with quatrefoils and trefoils. This slightly conical capelet was named after the hilarious Cary Grant movie. It is about elbow length and hangs open in the front. 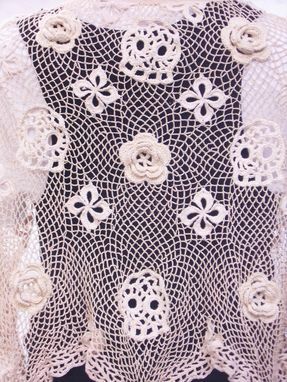 Three weights of cotton thread in six shades of ivory were made into this exquisite piece of lace using a method known as Irish crochet. The thread was meticulously gathered from yard sales and thrift stores, based on color and feel. The roses are 3-dimesional and stand out from the background. A large black button with a mock braided design that came from an old coat fastens it. These upcycled materials and many hours of crochet and planning conspired to create this adorable and subtly creepy capelet. Its simplicity makes it very versatile. Dress it up or down, using what you wear underneath. The capelet is shown with the Day of the Dead skirt and the skull and bones sweater vest.